The word comes from the Greek Taxidermy Taxis (placement) and derma (skin). It is the art of preparing the skin of animals to prevent organic decomposition (tanning) and shape your figure so that, once attached to the sculpture, get an animal life-like representation. The skinning is a fundamental task for not being well done, You can do a good job preventing taxidermy as unwelcome cuts and tanning done wrong can condition the length of the animal nature. Products are shown for tanning, the tools necessary for the preparation of the skin and skull (knife and cutting recess and molineta), and materials necessary for the modeling of the sculpture (plaster, mud, expanding foam resins etc..) and elements for termination and makeup (points, threads, brushes and combs, Crystal Eyes, oleos, ceras etc.). The different processes are also presented for the preparation of a partridge, a male wild Length and head of a Cobo of Buffon. 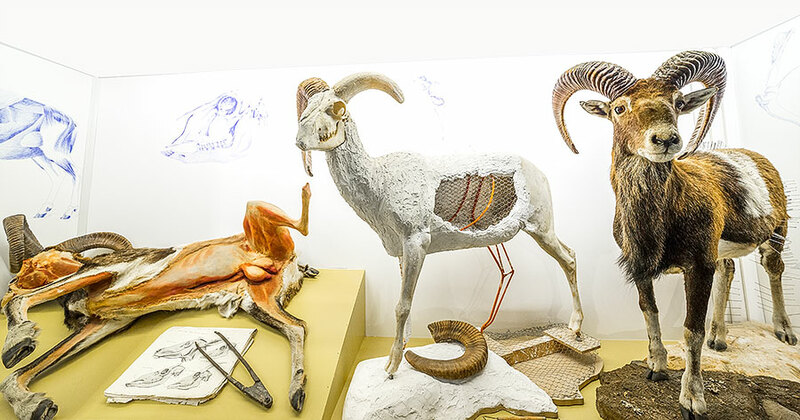 Close a panel that brings together three generations of taxidermists: Garo Pedraza. Garoz Sevilla and Garoz Sánchez.